Given that I mostly enjoy building tube amps that could have been built in the 1960s, this is a huge departure; we are zooming along to 1999 technology! 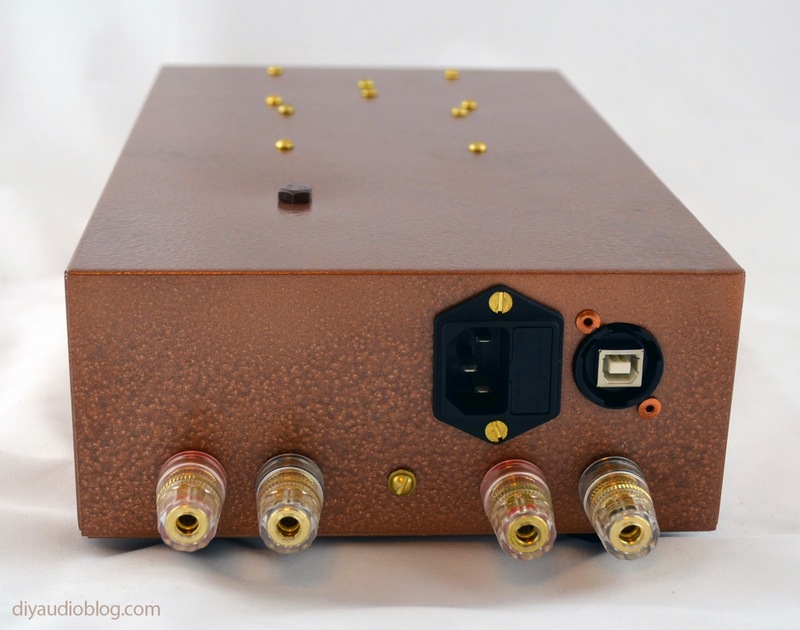 As you may have read, the well revered audio company 47Labs, who are known for their often simple, minimalist circuit topology, brought into the world the Gaincard, a $3,300 amplifier (with power supply) that would spark debate in the audio community for several reasons. The amplifier made use of the National Semiconductor LM3875, a 56 watt chip and relatively low capacitance. 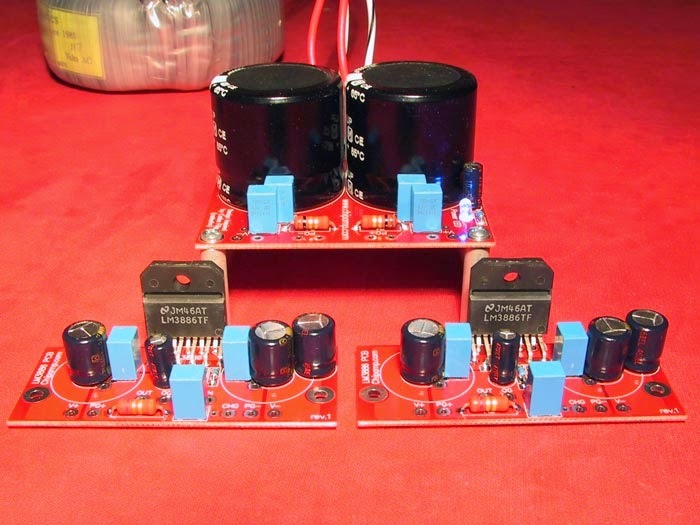 The internal parts were rumored to cost under $100, and the amp garnered a number of great reviews, so it was only natural that DIYers would want to try and duplicate, or potentially improve such an intriguing circuit. 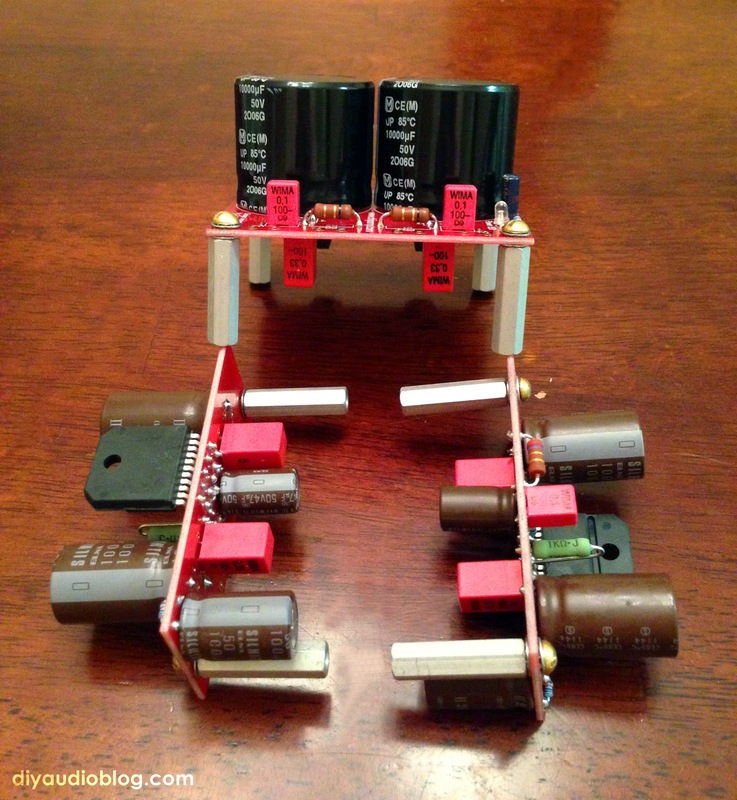 DIYers have created similar builds using a variety of power opamp or audio opamp chips including National Semiconductor LM1875, LM3875, LM3886, and LM4780. Likely the most popular chips are the LM3886 and LM3875. 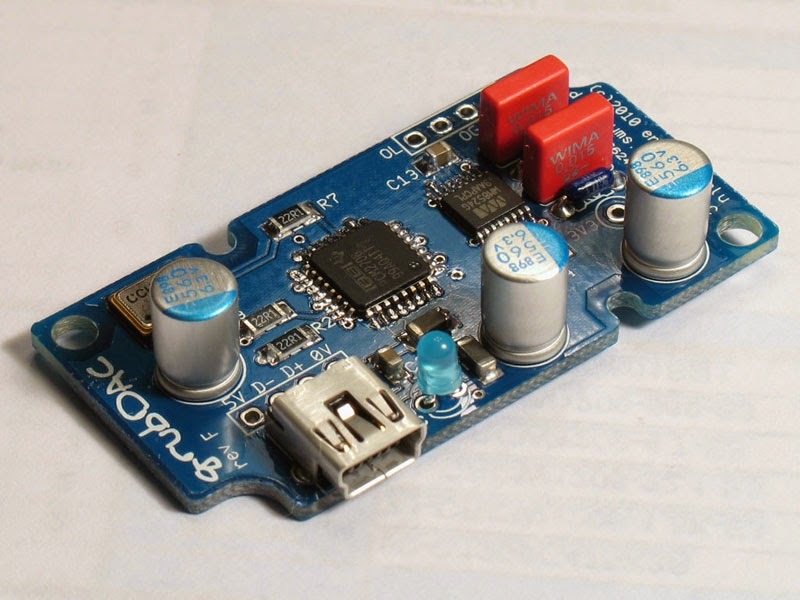 You'll find these in designs from Peter Daniel of AudioSector, Allan at Chipamp Electronics, DalAudio, and others. After reading about the various kits available, I settled on the LM3886 from Chipamp Electronics as I liked the idea of additional capacitance in the power supply. 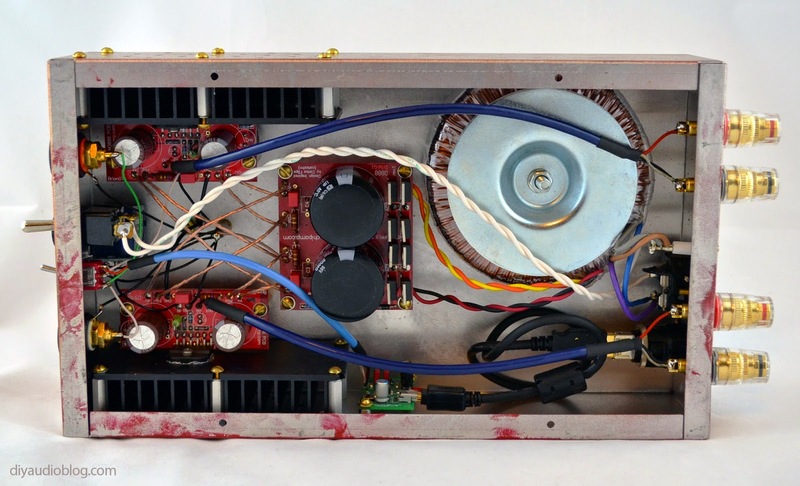 Aside for the boards and the limited number of parts, the build would require a transformer, a box, heatsinks, heatsink mounting compound, binding posts, RCAs, switches, an IEC inlet with fuse, wire, standoffs, etc. After roughly deciding on where each part would reside within Photoshop, I settled on a 7" x 12" x 3" aluminum box. Both Hammond and Bud offer boxes this size, I ended up going with Bud as it was in stock at Mouser. See the rough layout below. I prefer to fit the components into a case where there is enough room to breath, but there isn't a significant waste of space at the same time, so I generally avoid the 17" and 19" wide rack style enclosures. 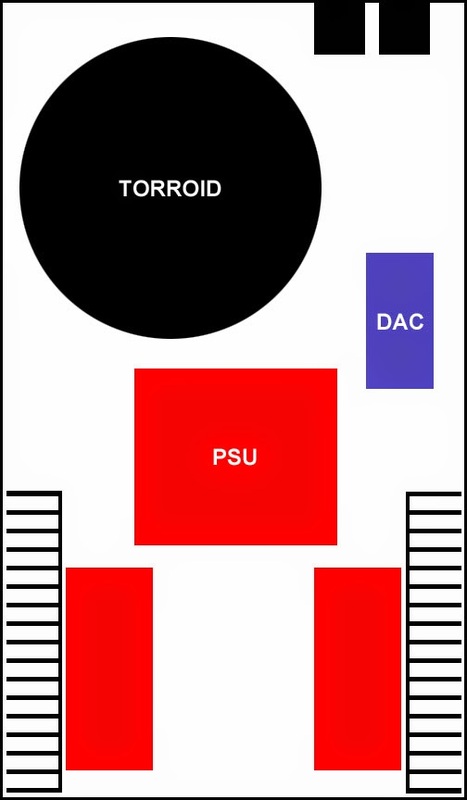 For the Toroid, an Avel 250VA 25V + 25V was selected (Model Y236652). Other brand options out there are AnTek and Plitron. 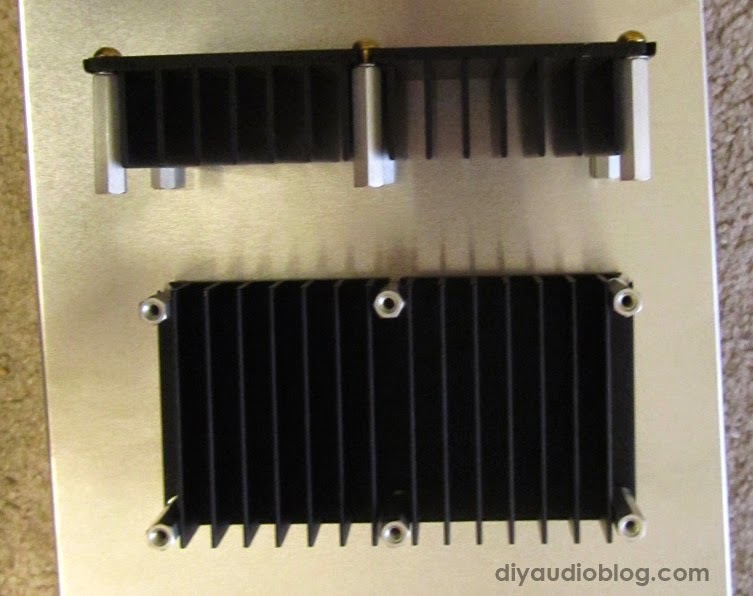 For the heatsinks, I found some reasonably priced ones on ebay that had mounting holes for screws. The instruction manual from Chipamp says you can also use a 3"x3"x1/2" piece of aluminum in free air in certain applications. I installed 1" aluminum standoffs on the heatsinks so I could mount them to the chassis with the fins facing the vent holes I planned to drill. 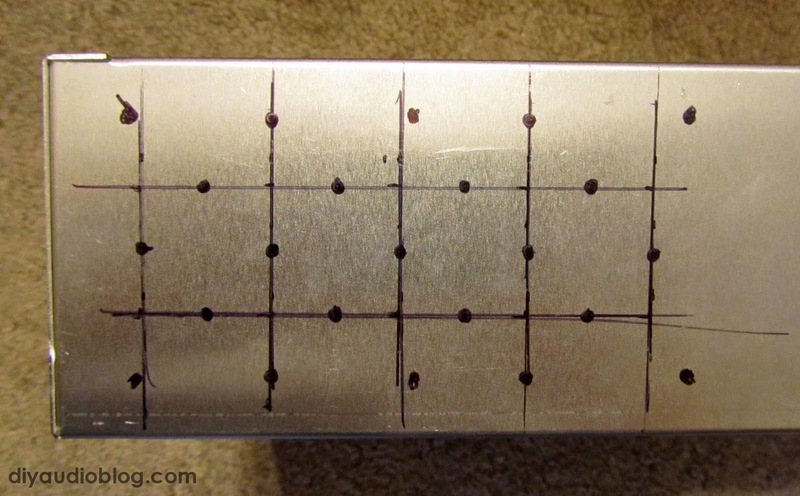 To create the vent hole pattern before drilling, I used a ruler and marked the chassis with an extra fine Sharpie. The holes for the heatsinks were also marked. The next, and most time consuming step, is to prepare the chassis by punching/drilling the various holes for the components. 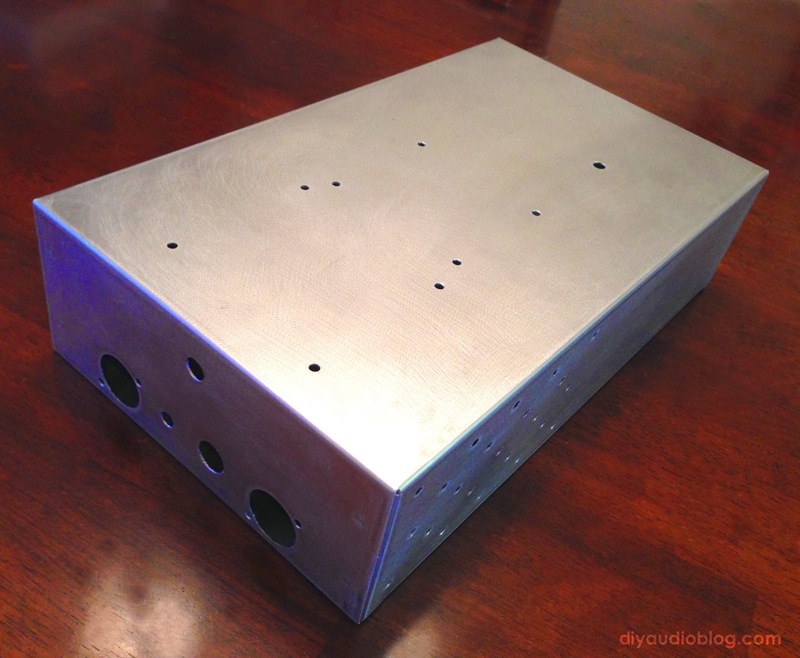 The Bud aluminum enclosure was quite thin and soft, which caused some mild chassis bending on the drill press. I don't think I would pick up one of these again, it's just too thin. Can't expect much for $30 though. Once the chassis had the necessary holes, it was sanded down and prepped for paint. 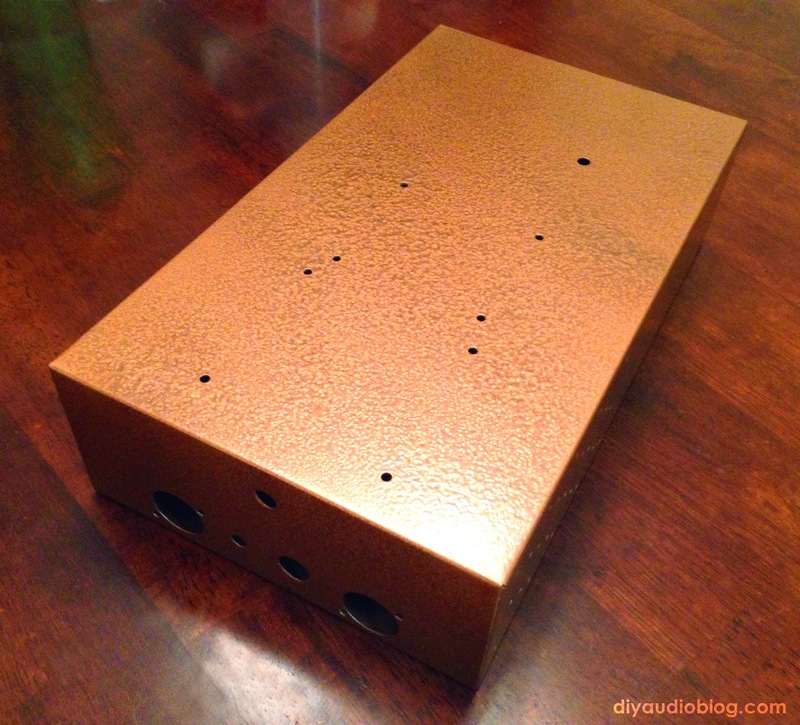 I used some Hammertone paint to give it a nice vintage patina with an interesting texture. With the chassis ready, I could concentrate on populating the PCBs. I purchased the kit from the Chipamp website, however decided to switch out a few of the parts for some brands I tend to trust, namely Wima and Elna. Wima polypros were used (and in higher values for coupling duty) where they fit, and Elma Silmic IIs were used for nearly all electrolytics (I had some of these already lying around, hence the 100v ones used on the signal boards). In addition, the resistor in the signal path was replaced with an equal value Kiwame. 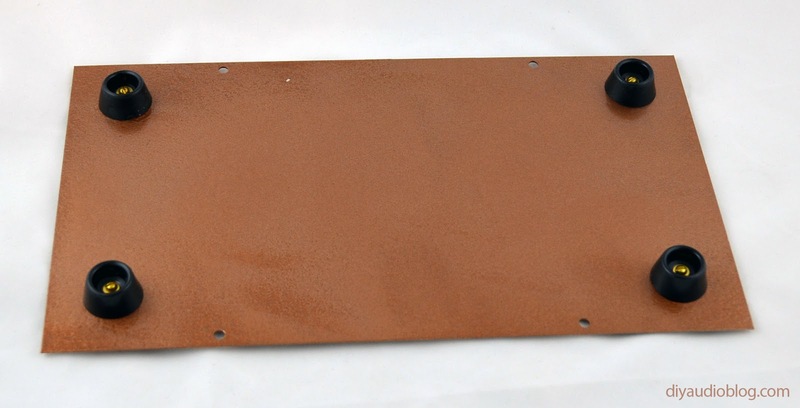 Surprisingly, the PCB holes were large enough to accommodate the thicker leads on this. As some of the parts were larger than the originals, they were mounted on the bottom of the PCB and long 1" standoffs were used. I ended up using one of the older green GrubDAC boards in this build and ran Belkin gold USB cable to a Switchcraft D planel mount USB connector for the back (part number EHUSBBABX). The board was mounted with standoffs to the side of the unit. A shielded Cardas 2x24 cable caries the signal to the front of the unit. Below is a photo of the completed interior of the unit. The LM3886s were fastened to the heatsinks with some Antec silver thermal paste between them. On the front of the unit is the power switch and an input switch that switches between the front D panel RCAs and the USB input. Power is carried with a twisted pair of 16 gauge silver plated copper wire in PTFE. Speaker output wire is shielded Cardas 21.5g x 2 wire. All signal wiring is run through 23.5g Cardas wire. The ubiquitous Alps Blue Velvet handles volume duty. 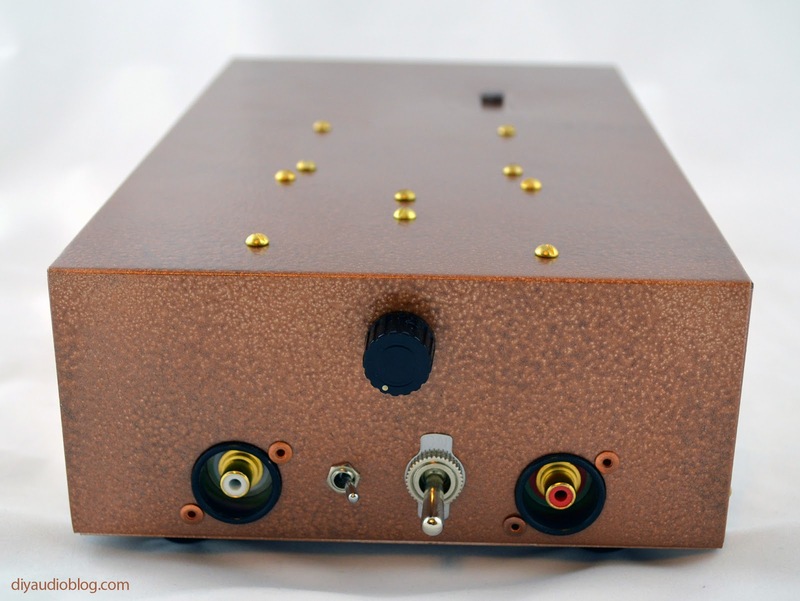 Extremely small signal paths, so the wiring costs are minimal despite using "boutique" Cardas wire. I used some generic yet very solid gold plated binding posts for the rear. The IEC inlet is mounted in a slightly odd position, but was necessary considering the small form factor. 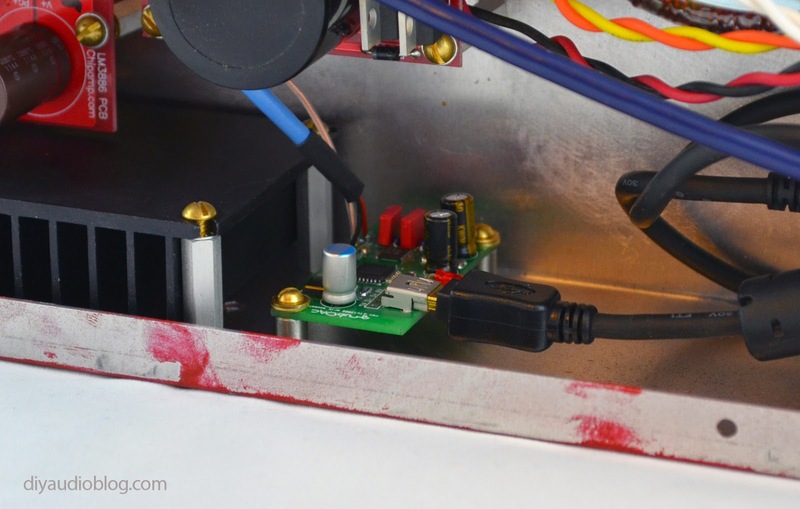 The purpose of this little build was to go into a PC-based arcade cabinet without taking up much space. You can check out that build here. I did spend a good amount of time testing the unit as I was very curious about sound quality considering the low cost and minimal parts. I was VERY surprised at how good this unit sounded. I haven't heard anything this good for this cheap. It's quick and robustly detailed but doesn't have that typical solid state presentation that I stray away from. 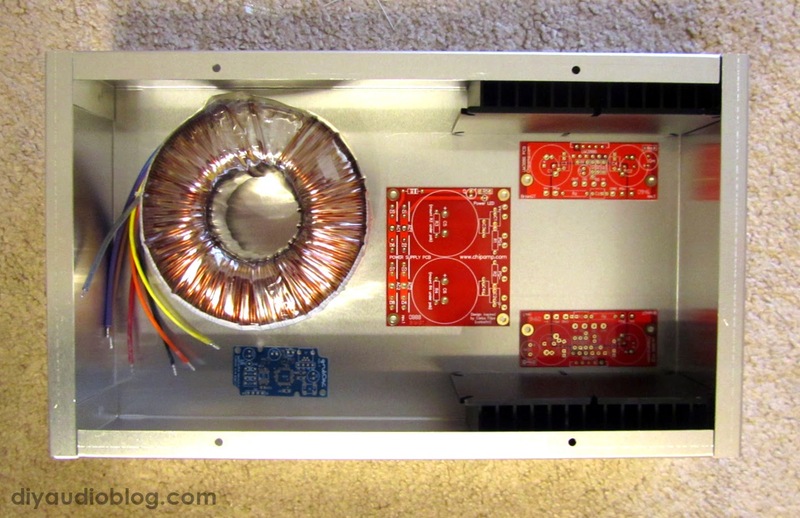 I may build another unit with a dual mono power supply and even nicer parts in the future. 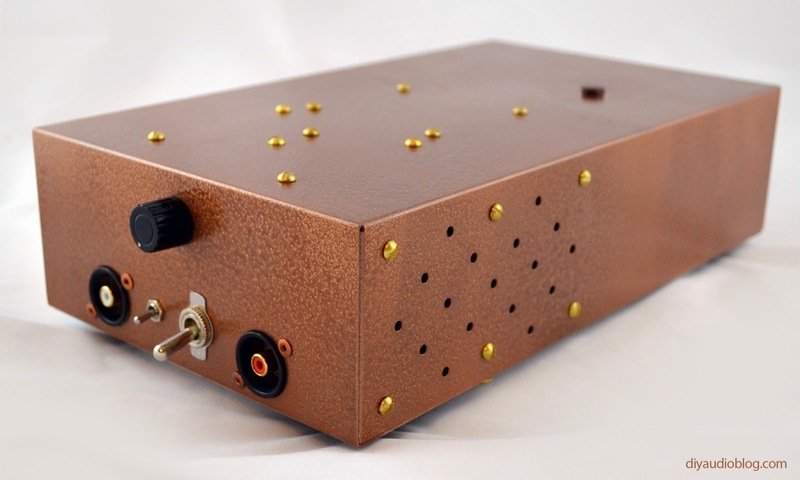 Allan at Chipamp Electronics has the LM3886 kits and numerous other accessories including a nice selector switch on PCB, potentiometers, upgraded caps and other items you'd need to build a great sounding amp on the cheap. As always, if you are in the market for some beautifully built custom audio cables, please check out Zynsonix Audio. They offer the highest quality parts and their prices are easily affordable.